The Secretary of State will be asked to grant powers to construct and operate the Boston Barrier today. The Environment Agency will ask the Secretary of State to grant powers to construct and operate the Boston Barrier through a Transport and Works Act Order (TWAO) today. The Boston Barrier scheme is part of a phased approach to reduce the risk of tidal flooding to approximately 14,300 properties in Boston over the next 100 years. Starting today, copies of the submitted TWAO documents will be made available to interested parties and members of the public will be given the opportunity to give their views on the proposals over a period of 6 weeks. 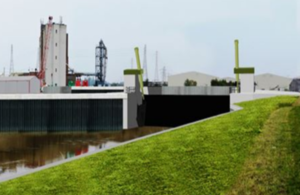 The TWAO, if granted, would allow the construction of a new tidal barrier with a moveable gate across the River Witham and a new building to enable operation of the barrier. It would also authorise the construction of new flood defence walls on both banks of the Haven, a replacement gate across the entrance to the existing Port Wet Dock and enable the Environment Agency to execute ancillary works, including dredging of the river. The barrier will give the area one of the best standards of tidal flood defence outside of London, so we’d like as many people as possible to see the Transport and Works Act application and talk to us about anything they’re uncertain about. The barrier will have the ability to control water levels along The Haven in the future, but only once appropriate subsequent approvals and works have been sought and granted. Although Water Level Management (WLM) originally formed a part of the Boston Barrier project, it was agreed by a Lincolnshire County Council Executive Committee in early 2015 that the further work required to take WLM proposals forward should not delay the tidal flood defence project. The main objective for the Boston Barrier has always been to protect this area from flooding. That must remain the main priority. We know all too well from bitter experience that there is no quick fix after flooding. In Boston it took 2 full years of misery and millions of pounds for many to return to anything like normal after the 2013 flood. In an ideal world, with endless finance, we would have all the bells and whistles. But the priority, now and here and in these cash-strapped times, is whatever we can get which works to protect against flooding as soon as we can get it. I have every confidence in the experts and professionals from the Environment Agency who tell us that the multimillion pound tidal flood alleviation barrier is the best it can be for Boston at this time; an assurance sought by our MP from ministers and an assurance given. The fact is that had the barrier been in position in 2013, it would have prevented that flood. It will give among the best protection from tidal flooding of anywhere in the country. Copies of the relevant documents will be available from today for local inspection at Boston Borough Council offices and the Environment Agency’s Boston Barrier Community Hub for a period of 6 weeks.